The MoA Classification has been updated by the IRAC MoA Team and the updates approved by the IRAC Executive. The latest version of the Classification Scheme can be downloaded from the IRAC website. 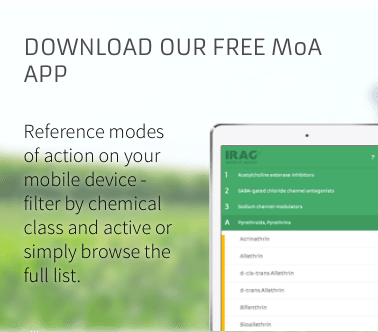 The English version of the IRAC Chemical Structures Poster and the small IRAC MoA Booklet have also been update and can be downloaded from the website.